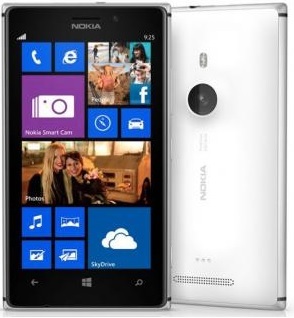 Nokia 925 can be termed as the big brother of its latest Windows 8 features prodigy, Lumia 925. It features several significant improvements, not a complete overhaul though, both in terms of performance as well as design. The 925 could emerge as the best Windows 8 Smartphone in the current market. Let’s have an overview. It boast’s of a gleamy metal body, which makes it stand out of the league of Lumia smartphones. However, it still sports the trademark polycarbonate back cover. It has cut down a few carbs, now weighs 139 grams only, and 8mm thinner. The metal body ensures a rugged look, while protecting it from minor falls and accidents. It is currently available in three color alternatives, White, Black and Grey. It is equipped with a Dual core snapdragon processor, clocked at 1.5 GHZ, with 1 GB RAM, with 225 Adreno Graphic Processing Unit (GPU). However, it features a disappointing downgrade to 16 GB of internal memory, along with a MicroSD slot for extension. Another disappointing downgrade is the lack of wireless charging capability by default, which was envisioned to cut down the extra weight and thickness. Not to mention, it would be equipped with Wifi, 4G LTE connectivity and A-GPS for accurate location tracking. It also sports a whopping 2,000 MaH battery, ensures a day long powerup. The most significant aspect of any Nokia Smartphone is it’s camera technology. 925 is equipped with 8.7 MP Pureview rear camera and 1.3 MP front camera. It delivers promising snaps and captures even in low-light scenarios. It has an intuitive Image stabilization functionality which enables you to capture photos and videos in fast-paced motion as well. Brand new ‘Best Shot’ feature captures 10 versions of a single image differed by millisecond time variation, and lets you choose the best alternative. There isn’t an official announcement regarding it’s price tag in India, it is rumored to be priced the same as current 920’s market price.